Montgomery County prosecutors have announced that they have taken down a drug ring that targeted Main Line high schools and colleges. The drug operation, named the “Main Line Takeover Project” by its members, was reportedly well orchestrated and executed. 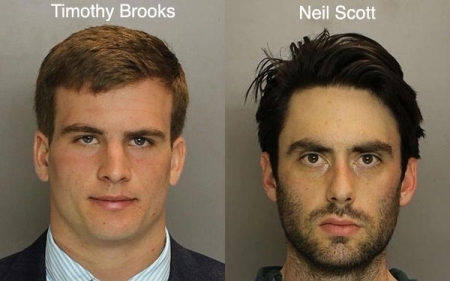 Haverford School graduates Neil Scott, 25, and Timothy Brooks, 18, were the ringleaders. Their intention was to take over drug sales in the Main Line area. They recruited local students to be their “subdealers” and sell cocaine, marijuana, hash oil and ecstasy. Scott and Brooks set quotas and expected results from dealers. In total, 11 people were charged by authorities. The schools in the group's 'target market' include Harriton, Lower Merion, Radnor, and Conestoga High Schools, the Haverford School, and Gettysburg, Lafayette, and Haverford Colleges. A passing runner jumped into the water to help save a rower along the Schuylkill River near Boathouse Row this morning. It happened around 6:30 a.m. as John Hewson and crew mate Jeremy were finishing their workout in a two man boat near the lighthouse. Jeremy had a seizure, the boat tipped, and both were thrown into the cold water. Hewson was having trouble holding up Jeremy, who's 6'4”. That's when an unknown jogger heard the cries for help, took off his shoes and jacket, and jumped in. That jogger, now known as Stephen Giorgio, says he did was he feels he was supposed to. Despite suffering cuts to his legs from the rocks, he dried off, without identifying himself and finished his run. Jeremy is still hospitalized but is expected to be ok.
Half of Philadelphia's “Bonnie and Clyde” identity theft duo is back in trouble and back in court in Center City today. Jocelyn Kirsch appeared today in US District Court before magistrate David Strawbridge. She is charged with shoplifting a purse from a Nordstrom's in California and more poignantly with parole violations that can send her back to jail. Kirsch, who attended Drexel, and her boyfriend, Edward Anderton, a Penn grad, stole ID's, credit cards, and credit information from numerous victims totaling $100,000. They lived in a lavish condo and took expensive vacations. The couple was caught in 2007. In 2008, Anderton was sentenced to 4 years, Kirsch to 5 years. She was let out on parole in 2011. Today she was ordered to stay in jail until another hearing on April 29th. In additions to her recent arrests, Kirsch has not kept up her required monthly restitution payments. Clear skies, temperatures in the low 60s/upper 50s this evening in Center City.